Home Use Cases Grip on the NPS! The main question from organisations around the NPS focuses on which drivers have concrete impact on the NPS and how can Underlined’s knowledge and research capabilities be used to provide insight and understanding? What are the drivers that affect (decrease/increase) the NPS and what is the impact of these drivers on the NPS? What improvement initiatives should be given priority? Underlined starts by creating a representative NPS set; from feedback, behavioural and customer characteristics data. The relevant data is then fed through the Underlined Hub for CX Analytics or via the API modules and enriched directly. Underlined has developed an NPS driver Model that allows you to see which levers can be pressed to get movement in the NPS . This model is often used in combination with text mining to get the essence of customer feedback (open questions) and textual customer contact sources (e.g. e-mail, chat, CRM logs). By applying the driver model to an extensive historical NPS set, preferably at least using one year of (feedback) data, you will immediately understand which drivers have the greatest impact on the NPS. This will then provide a set of actionable insights which should be given priority in order to move the NPS . A periodically updated dataset and clear management dashboards will continually give new insights. NPS improvement of at least 10+ points in year one. Concrete insight into NPS drivers, based on customer data. Insight, data driven, into the impact of the different drivers on the NPS. Advice on improvement initiatives, based on data. Management control over prioritising decisions regarding improvement initiatives. Reduction in process costs; a reduction in hygiene calls of at least 20% in year one. Management dashboards in which NPS actionable insights are visible and can be used for all departments in the organisation. 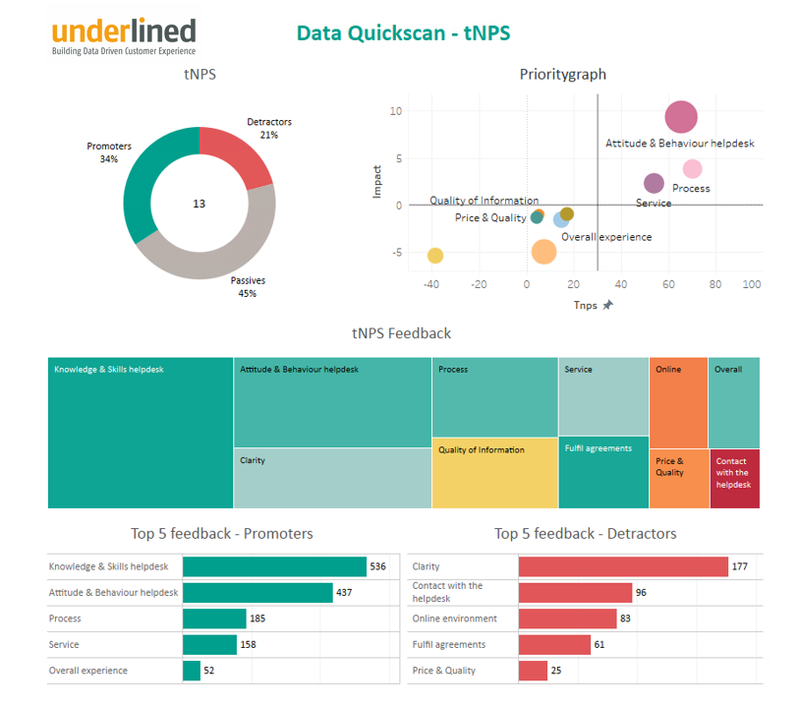 Dashboards provide continuous company wide insight into the the impact of NPS drivers.